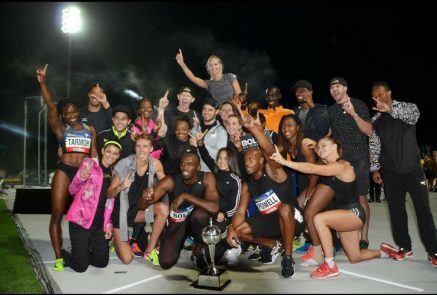 11th February 2017 – Usain Bolt (JAM) gave the perfect captain’s performance as he led his team of the Bolt All-Stars to overall victory in the Nitro Athletics Series. He was more than ably supported by Jenna Prandini (USA) who also remained unbeaten over the three meetings. In Match 2 Jenna won the 60m in 7.27 seconds before they both formed part of the winning mixed 4x100m relay team. It was much the same in Match 3 with Jenna again winning the 60m and both being part of the mixed 4x100m relay team, only this time Usain also won the 150m and Jenna ran the opening leg of the 2x300m in which her team crossed the first in 69.73 seconds. Representing England Christine Ohuruogu (GBR) and Michael Rimmer (GBR) also contributed valuable points for their team. In Match 2 Christine ran the second leg for the victorious mixed 4x400m team and Michael’s pairing finished third in the 3 minute run. In the final match Christine ran the opening leg in the 2x300m with her team finishing second while Michael anchored his 2000m medley relay team to second place.